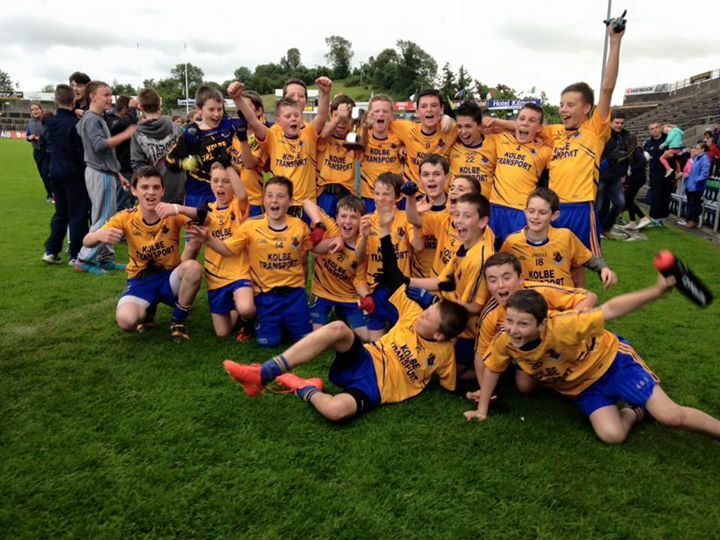 Congratulations to our u13 boys who claimed the division 5 league title tonight with a fantastic win over St Joseph’s. A strong second half saw us run out comfortable winners. There were some brilliant displays all round, especially from Patrick Lynch, Aaron Gaffney, Adam Clarke, Dean Carroll and Liam Maguire. Special thanks goes to Noel and Connor and all the management team for their hard work and a special mention goes to the mammies and daddies who have followed the lads throughout the year. Victorious Team:- Patrick Clerkin, Jamie Shanley, Daniel Ward, Oisin Harkin, Aaron Gaffney, Patrick Lynch (C), Liam Maguire, Adam Clarke, Dean Carroll, Killian Mc Donald, Kieran Duffy, Subs Keelan Keapock, Dermot Mc Cabe, Rhys O’ Reilly, Ryan Conroy, Oisin Pepper, Michael Rice, Eugene Coyle, Alex Perry, Peadar Mc Cabe, Darragh Lynch, Jake White-Duffy.